The most important number for most investors is the yield to maturity. This number represents the average annualized net return of your portfolio. The value assumes that you keep the portfolio until it matures and no new investments are made. This information is found on the “Net Return” button on the “Dashboard” page. The first decision to make when using this data is if you want to view the information under the “Use only your history” option, or under the “Use overall Bondora portfolio” option. Investors who hold a portfolio that has accrued enough data with a well-established track history will want to choose the “your history” option. This choice will create a more accurate representation of the true yield based on the metrics specific to the investor’s holdings. Generally, 6 months of data are needed before a meaningful yield can be calculated. The “overall Bondora portfolio” choice is best for those who have new portfolios without any data. Remember, new originations will carry different risk levels and pricing than those used in the pre-set assumptions. Therefore, the number should be considered representative of past data only. The calculation methodology for both these options is identical. Bondora uses historic cash flows, and then calculates the percentage of payments received versus payments scheduled for each period. This analysis is performed separately for loans that are not in default and those that are in default. The calculation is also separate for principal and interest payments. Future cash flows are all risk adjusted based on the historical data used in the previous steps. Finally, investors can further refine the prediction by entering their effective income tax rate. While the calculation is limited only to cash flows expected up to maturity, ultimately investors may earn more given that recovery and collection efforts add to the total. In addition to using the values based on the Bondora’s overall or your personal portfolio history, investors also have the option to customize the values with the sliders to fit their expectations. 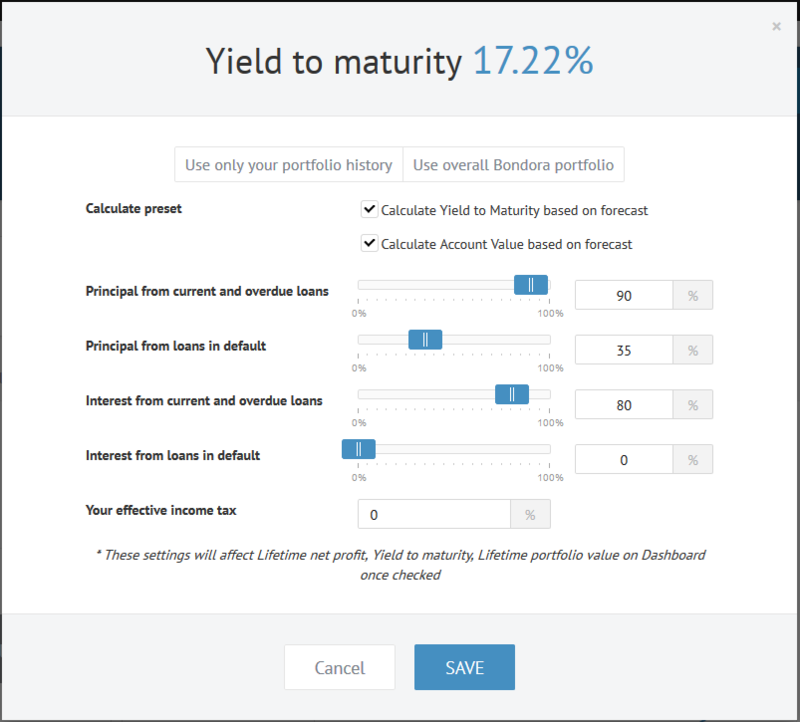 In order to use the settings and values that you have chosen in the Yield to Maturity settings view, all you have to do is mark either one or both of the checkboxes for “Calculate Yield to Maturity based on forecast” and “Calculate Account Value based on forecast” and click “Save“. 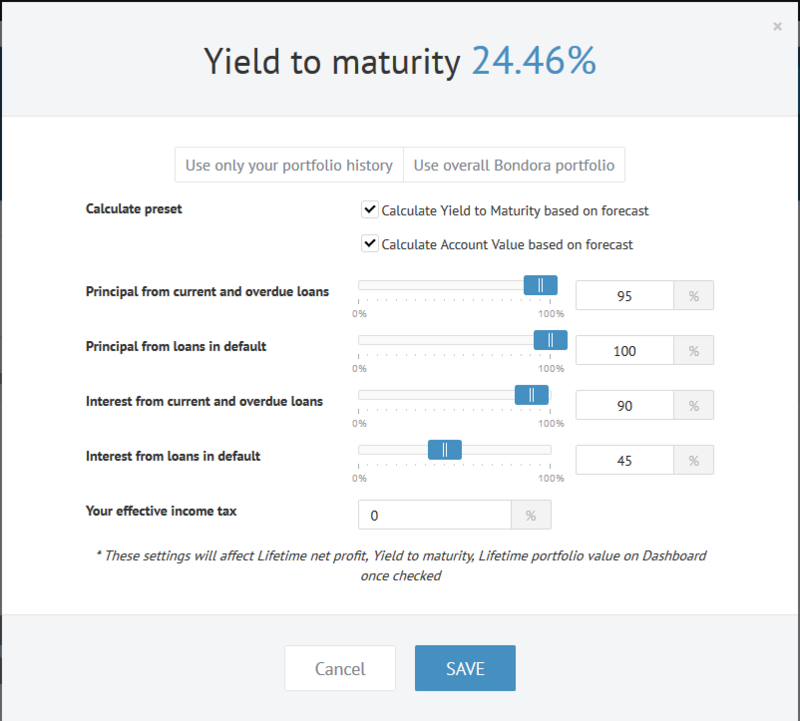 “Calculate Yield to Maturity based on forecast” – calculates the Yield to Maturity value using the values you set and displays that value on your Dashboard instead of the default net return value). “Calculate Account Value based on forecast” – recalculates the Account Value on your Dashboard based on the values you chose.